I love electronics and gadgets. This includes digital cameras. Do I get excited about the newest advances and models? Yes I do. At the same time I’m aware of how easy it is to get on the upgrade cycle treadmill. When the new 42 megapixel full-frame wonder hits the streets, it’s easy to start thinking that you’re 24 megapixel wonder of yesterday is no longer adequate; that the pictures you took six months ago will never measure up again. But it’s not hard to see how that kind of logic is patently false. We don’t have to question the promise of new technology to still see the value in older tech. Or, put another way, a working camera doesn’t become obsolete just because another model comes along. On top of that is the environmental impact of the relentless upgrade cycle. Where do those discarded cameras go? Some go into the hands of new owners, but eventually some end up in landfills or “recycled” somewhere far from North America where we don’t know if the toxic compounds are contained or released into the local environment. It’s clear to me that upgrading is not as simple as the money spent. That’s why I’ve been a very satisfied user of a Sony NEX–5 for eight years now. I bought this camera in 2010, after having a thorough test drive in a camera store in Westwood, Los Angeles. The NEX–5 was one of Sony’s first entries into what is now known as the “mirrorless” or “interchangeable lens compact” sector that was pioneered by Olympus in 2009 with its first digital Pen model, the E-P1. Sony changed the game by creating a very small camera with a APS-C sensor, the same size as most consumer dSLRs and significantly bigger than the micro 4/3 sensor in the Olympus models. I was attracted to having a dSLR quality camera that would fit into a jacket pocket, with very little compromise. And upon trying the NEX–5 I was won over. At the time there were just three lenses available for the camera. A 16mm pancake and a 18–55mm zoom were the kit lenses, with an optional, and much larger, 18–200mm lens available. When I asked about the big zoom, the salesman actually talked me out of it, saying that it worked against the size advantage of the NEX, and that I’d be happier with the smaller lenses. Eight years on that remains the case. In the interim Sony has built a big business on top of this foundation. At least six models of APC-C sensor cameras have been release, culminating with the a6000, a6300 and a6500 that are currently available, along with the “full frame” a7 and a9 lines. Yet, for all the advancements I’ve remained satisfied and loyal to my first generation NEX–5. That’s because the camera is quite good enough, thank you very much. What I found in the NEX–5 is a camera that is just the right size and proportion for a good walk-around and travel camera. I really like the small pancake lenses that are available for it, along with the ability to easily adapt lenses from just about any other manufacturer or lens mount. All of the newer a6000 series models are bigger than the NEX–5. Yes, they include viewfinders, which are nice, but that also increases their bulk. The NEX (or a5100, a6000 or a6300) isn’t the camera you use to take shots of wildlife hundreds of meters away, or of sports. But it makes a great replacement for a smartphone camera or point-and-shoot, delivering much better quality overall, along with greater control. My favorite lenses are the 16mm and 20mm pancake lenses which keep things very compact, while maintaining very good image quality. Are they strong competitors for the equivalent Nikon or Canon dSLR lenses? Probably not. But they weigh just a fraction and easily fit into a small bag or jacket pocket (and cost less, too). Every circumstance involves compromises, and where size and weight are concerned, these two lenses fall on the right side of that compromise. Even when working at high ISOs, say 1600 or above, it seems like some kind of plateau was reached around 2010. I don’t doubt that 2018 cameras are even more noise-free in low light, but my NEX–5 is so good enough that it doesn’t make me pine away for a new model. In many ways, technique is more important that raw technology. 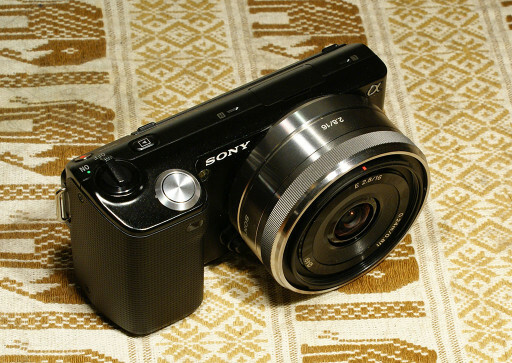 Now, the NEX–5 isn’t a perfect camera. The shutter is louder than I want or think it should be. The minimalist set of controls means digging into menus more than I would like. And I wish the video included a cinematic 24-frames-per-second option, rather than just 30-frames-per-second. Probably the biggest gripe someone could have is its proprietary accessory system. It doesn’t have a standard flash shoe, requiring specialized flashes and accessories. That’s annoying, but not a deal-killer (and I’ll have more to say on that in a moment). But that’s about it for my complaints. I understand that I could get a little better low light performance, maybe a quieter shutter and better autofocus with a new model. But for my style of shooting, which is street-style, architecture and candids, it doesn’t make a lot of difference. My NEX–5 continues to soldier on, and I’m happy to use it. Because I bought into the NEX system soon after its debut, I invested in the specialized accessories. I have the higher-powered flash and bought the optical viewfinder that pairs with the 16mm pancake lens so that I can use it like a point-and-shoot in bright light that washes out the rear LCD. I also bought the stereo microphone for video, and even adapted a 20mm viewfinder to work with the 20mm pancake lens. In the end I have a kit that satisfies my needs and fits my shooting style. Because of this, I’m hesitant to jump into another system, or into Sony’s newer models that have dropped this proprietary connector in favor of a standard flash shoe. While I can’t argue that adopting the standard flash shoe was a sensible move for Sony to take, I like my accessories. Sony still makes a model with the same basic form factor, the a5100. But I consider it crippled because it doesn’t have the accessory connection that the NEX–5 has, and it also doesn’t have a standard flash shoe. While it does have a 24 megapixel sensor, I consider that to be overkill for a compact camera, having to compensate for the noise generated by smaller pixels. And since my NEX–5 is still a very useful camera, I see no reason to abandon the system. A working camera that you know and are familiar with is valuable, regardless of whatever the market says or what the state-of-the-art is. That’s the sort of philosophy I think that informs the current generation of film camera users. As I write this, I have to admit that I just upgraded my camera kit. But not significantly. That story is for my next post.